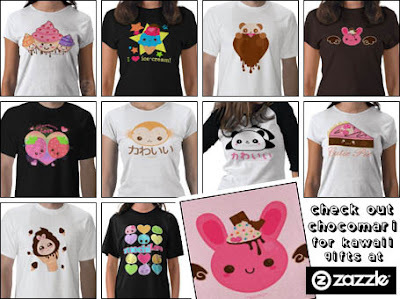 KawaiiPunk - Kawaii Mascot Blog: Sweet Sensations at Chocomari! Ta da! The shop is called Chocomari and, much like me, it has decided to ignore tradition and gorge itself on as many sweet things as it can get its hands on! Yay! So at Chocomari you can find super sweet ice creams, gorgeous cupcakes, and plenty of tasty, tasty chocolate treats! And, because all these sweet sensations are on t-shirts, you won’t have to worry about diets to enjoy them!